When it comes to post-war wallpapers the kitsch award goes to American manufacturers. From the late 1940s through the 1950s the United States churned out more novelty wallpapers containing a greater volume of funky, humorous designs than probably all other nations combined. 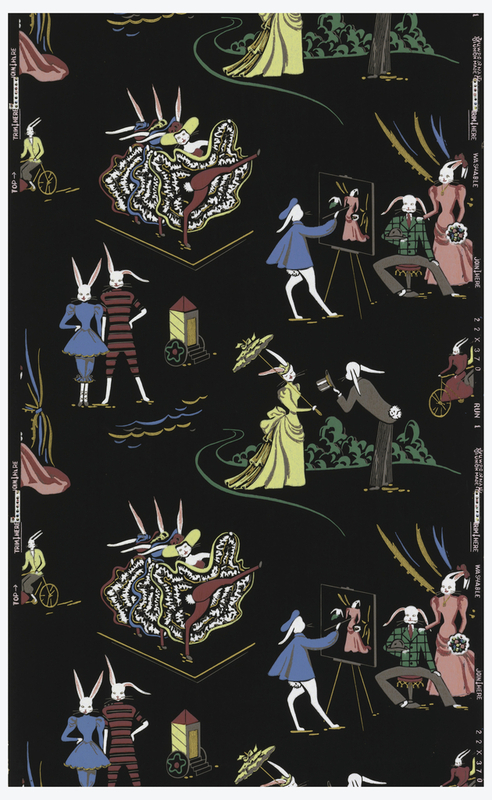 This wallpaper with rabbits is a perfect example, with Victorian bunnies sporting bathing suits, touring on a tandem bike, sitting for a portrait, even kicking paws high in a cancan line. And this design is given strong competition from other wallpapers bearing chartreuse deer prancing about in long floral veils, to barbecues and cocktails, while my personal favorites are the French poodles, performing all manner of humanly activities from promenading under the Eiffel Tower, to smoking cigarettes on a park bench, to coiffing in a beauty parlor for a night out at Club Chien. Another major producer and exporter of post-war papers was Germany, who took a very different approach in their designs. The German papers tend to be more abstract with an artistic slant, and many of these designs still appear modern today. These designs tended to be printed in more neutral shades with little splashes of color, unlike this design with its black ground which makes the colors pop. German manufacturers also had their share of novelty papers but they leaned more toward romantic views than kitsch. All jokes aside, it is understandable why the kitsch appeared at this time. The world was in recovery from a devastating war and I’m sure subtle attempts at humor were appreciated, even when it surrounded you on four walls. And to keep it in perspective, these kitschy designs were usually reserved for powder rooms or bathrooms, kitchens, possibly bedrooms, while the public rooms could still be papered with more serious or elegant designs. Something for everybody! I hope you are working with some of the textile converters who produce and sell novelty cottons to quilters and other sewers and crafters. These are delightful (probably out of patent/ copyright) and should be enjoyed by new audiences in new ways.